AviaAM Leasing, a global aviation holding company engaged in commercial aircraft acquisition, leasing, and sales, has announced the sale of two Airbus A321-211 from its fleet. The aircraft have been sold with lease attached to a global private equity investor. Since May 2018, both aircraft have been in operation under the largest narrow-body ACMI operator in the world and the largest airline in Lithuania, Avion Express, with a 6-year operating lease agreement. “We are delighted to complete this transaction of two newly refurbished and leased aircraft. This transaction is a result of the great relationship and well-coordinated work between two companies. Our team is looking forward to working on more successful deals with our global private investment partner,” says Tadas Goberis, Chairman of the Board and CEO at AviaAM Leasing. The investor acquiring the aircraft received the contract of ownership for the two Airbus A321’s through a successful transfer on October 15, 2018. 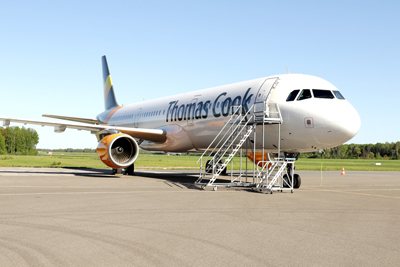 Both aircraft are empowered by CFM56-5B 3/P engines and are currently dedicated to the operations of the British air carrier Thomas Cook Airlines.